We’re currently working with two versions of our drama corpus: the earlier version contains 704 texts, while the later one has 554, the main distinction being that the later corpus has a four-way genre split – tragedy, comedy, tragicomedy, and history – while the earlier corpus also includes non-dramatic texts like dialogues, entertainments, interludes, and masques. Recently we’ve been doing PCA experiments with the 704 corpus to see what general patterns emerge, and to see how the non-dramatic genres pattern in the data. The following are a few of the PCA visualisations generated from this corpus, which provide a general overview of the data. We produced the diagrams here using JMP. The spreadsheets of the 704 and 554 corpora are included below as excel files – please note we are still working on the metadata. This is the complete data set visualised in PCA space. All 704 plays are included, but LATs with frequent zero values have been excluded. It seems that tragedies and comedies are characterised by sets of opposing LATs. The LATs associated with comedy are those capturing highly oral language behaviour, while those associated with tragedy capture negative language and psychological states. Tragicomedies and histories – although we have yet to investigate them in detail – seem to occupy an intermediate space. If we unhide the non-dramatic genres, we can see how they pattern in comparison. Docuscope was designed to identify genre, rather than authorship, so perhaps we should not be surprised that authorship comes through less clearly than genre in these initial trials. We should also bear in mind that there are only 9 genres in the corpus, compared to approximately 200 authors. From this we can deduce that Seneca’s tragedies are linguistically similar, as they are grouped tightly together. The same applies for looking at date of writing across the corpus, with approximately 100 dates to consider. ‘the size of it all carries us along’ – a new kind of literary history? Ted Underwood, 2014, ‘Theorizing Research Practices We Forgot to Theorize Twenty Years Ago’, Representations <http://hdl.handle.net/2142/50034>. The previous two posts explored how an eighteenth century novel uses words from an associated topic to fulfill, and perhaps shape, the expectations of an audience looking to immerse themselves in a life as it is lived. In this post I want to think a little more about the idea that the red words identified by Serendip’s topic model do something exclusively “novel-like” and that the blue words are exclusively “philosophical.” Both sets of words seem, rather, to aim at a common target, since each contributes something distinctive to the common project of rendering a moral perspective on lived experience. I want to caution against thinking of these topics as “signatures” of different genres; they may instead index narrative strategies that criss-cross different types of writing. 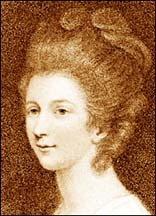 After relating several details about her relationship with her aunt and uncle, Maria concludes: “BEING in this unfavourable disposition towards me, he [Sir John] was easily persuaded to press me to a marriage, in which my in|clinations were much less consulted than my interests.” This sentence illustrates some of the dynamics that Park described in her earlier post. On the one hand, Maria’s letter immerses the reader in a scene from life, rendering vivid the circumstances that led her uncle to make a fateful decision about Maria’s marriage prospects. Yet at the same time, the narrator dips frequently into the vocabulary of a more removed and somewhat static moral judgment – one that appraises “circumstance” in relation to “actions” and “interest.” The red words, novelistic in our analysis, are the words that show us how something happened: Maria’s uncle Sir John decided to force her into “marriage,” ignoring his niece’s wishes or inclinations because he was in an “unfavourable” disposition that made him more easily “persuaded” to this course of action. (We are getting contextual details – backstory – that make his decision intelligible.) These red, novelistic topic words – marriage, persuaded, unfavorable – are thus necessary for rendering the sequence of events that prompted her change of fortunes. A man was persuaded, his favor had changed, and a marriage ensued. But the narrative sequence opens up onto a more general possibility for analysis. An abstract noun – “interest” – is offered as the nominal criterion for her uncle’s decision, but in the context of the sentence it seems to gloss the uncle’s reasoning as he might represent it to Maria (“this marriage is in your interest”), not the narrator’s feelings about that reasoning (“it was in my interest”). What we are getting, then, is the narrator’s view of how her uncle made his decision, what circumstances contributed to his thinking, even the abstract concept that he could have invoked in the absence of any residual “natural” sympathy for his niece’s inclinations. One sees, perhaps, a tension between the kinds of abstract nouns that appear in works of moral philosophy – in the screen shot above, “natural” “actions” “circumstance” “interest” – and the concrete terms of relation that render action for us in a more vivid, immediate way. What is interesting about this passage is that it shows us how flexible the abstract vocabulary of moral philosophy can be when it is introduced into the narrative stream of a novel. In the passage above, Maria tells us that her aunt, Lady Harley, was stung by jealousy when she witnessed Sir John’s pleasure at hearing his niece read. Out of spite, the aunt insinuates that there is a contradiction between the “oppression and faintness” that Maria purportedly has complained of and her manifestly good spirits, which Sir John would otherwise take on face value. Maria then uses the abstract noun “circumstance” to characterize the fact of her good spirits, a fact which Sir John is now (culpably) discounting. Maria is moving into the realm of generalization (“I have often observed…”), and this shift requires the writer to “investigate” the ways in which Sir James was led to “compare” Maria’s behavior with a secondhand “picture” that has been drawn of her “disposition” by her aunt. These blue words might be seen as pivots in a process of moral judgment – the same process that the novel’s reader had to employ in evaluating Sir James’ earlier souring on his niece. Because this process itself is now the subject of narration, it is not surprising that the vocabulary needs to be more structured and abstract. In using Serendip to explore how Euphemia behaves linguistically qua novel, then, we must start with the idea that novels mix the vocabularies of these two topics in order to layer points of view and to involve the reader, experientially, in a world where actions have moral significance. Moral philosophy words (blue) are important because they mark occasions where that state of experiential immersion has been temporarily deflected onto some explicitly moralizing, explicitly generalizing consciousness, a consciousness which may or may not be that of the narrator. Regardless of its origin, the capacity of that consciousness to withdraw temporarily from the particulars of the narrative and to render judgment on a kind of act seems a crucial aspect of the novel’s program, which Julie Park described in her previous post in terms of the novel’s epistolarity and emphasis on sensibility. In this passage, Smith is describing the way in which a man – any man whatever – will alter his treatment of his friends if suddenly elevated in social status. Such a man becomes insolent and petulant, which is why Smith believes that one should slow one’s social rise whenever possible. “He is happiest,” Smith writes, “who advances more gradually to greatness, whom the public destines to every step of his preferment long before he arrives at it…” Smith is encouraging his audience to pass judgment on a drama whose characters are never rendered concrete, characters whose actions illustrate a concept. The closest Smith gets to a novelistic treatment of the life world occurs just after he has presented his maxim above. Instead of calculating and re-calculating one’s standing among friends, Smith writes, one should find “satisfaction in all the little occurrences of common life, in the company with which we spent the evening last night.” Smith modulates into the red here, drawing words from the life world as if he himself is reporting on events in his own life just the night before, events which ground and so justify the moral pleasure he takes in them precisely because they are not bloodless and calculating. Smith has, for a sentence or two, become an epistolary novelist, and it is this sudden (and relatively rare) excursion into the every day – the world of “last night” – that allows him to show the difference between happiness and its opposite. The Novel and Moral Philosophy 1: What Does Charlotte Lennox Have to Do with Adam Smith? 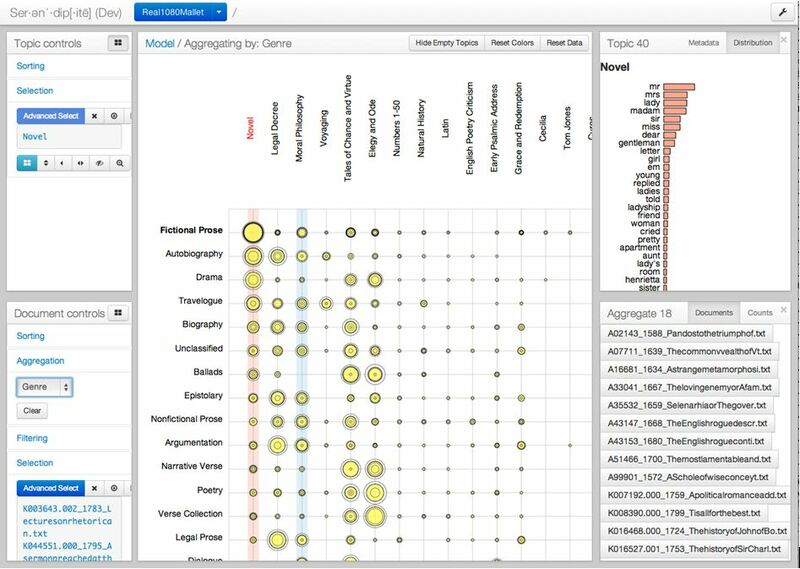 The Visualizing English Print group is using new visualization tools to study genre dynamics in our corpus of texts spanning the years 1530-1799. While far from comprehensive, the corpus spans an interesting period in the history of English print. Most literary historians, for example, would agree that this is the period when the novel emerges as a distinct generic form. 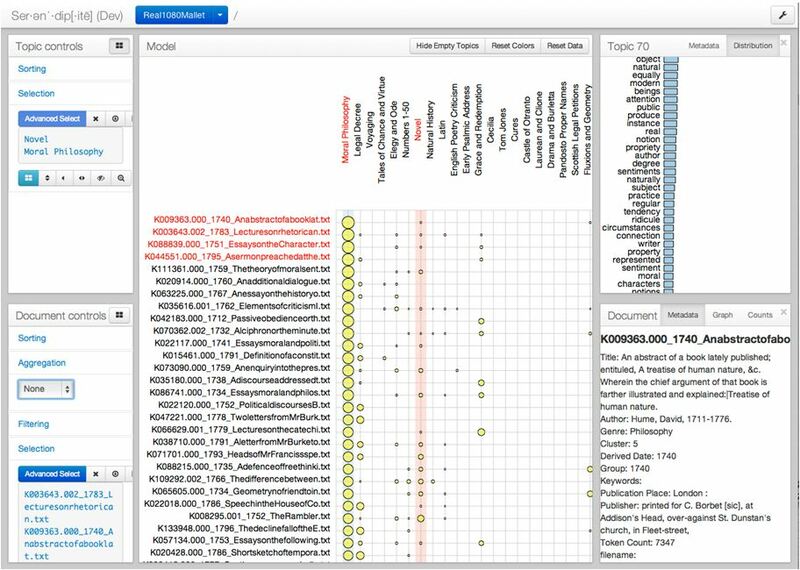 One of the tools we are using – a re-orderable matrix and topic modeling tool called Serendip – has generated topics that illuminate this development in our corpus. We began that work by first labeling all 1080 items by genre, something we had to do if we were going to see any patterns in the larger collection. (A downloadable spreadheet of both the items and the genre labels applied to them appears in a spreadsheet here.) This post deals with two algorithmically generated topics that we found useful in identifying items we had previously labeled “prose fiction” and “philosophy.” The topics were generated through a process known as Latent Derichlet Allocation (LDA), a technique commonly used to sort through web pages or documents in large collections of texts. In exploring the VEP corpus with Serendip, we saw that our prose fiction texts – particularly the eighteenth century novels – were related to our philosophy texts in some interesting ways. We began to understand that relationship when we noticed that prose fiction and philosophy texts shared the topics that are present in large measure in each of them individually. (A topic is a collection of words that tend to co-occur with one another in individual documents; one might think of them as “ingredients” that are mixed together to create the full variety of documents in the corpus.) The first of these topics was characteristically present in texts classed as prose fiction, which was reasonably interesting. More interesting still: we found that the type of texts next most likely to contain words from this “prose fiction” topic were those we classed as “philosophy.” And the topic that was most prevalent in philosophy texts – in this case, works of moral philosophy by thinkers such as Smith and Hume – were also present in our prose fiction novels. Why this overlap or sharing of ingredients? Where does the novel stop and moral philosophy begin? Before attempting an answer, it is important to understand what kinds of works qualified, in our naming game, for membership in these two groups. A complete list of works in the corpus, with their genre classes, can be found at the link above. Below we list only the works in these two classes. Our naming convention begins with a date of publication, short title of the work, author, and assigned genre class. Our dates here refer to the date of the edition transcribed by TCP in a corpus assembled at random: per our earlier post on the corpus, it is composed of 40 randomly selected texts per decade. The corpus was thus specifically not created for the purpose of exhaustive surveying any one literary form. Our purpose, rather, was to see how much we could learn from a relatively small sample of what TCP had transcribed. 1668 LifeOfMeritonLatroon Head, Richard, 1637?-1686? 1680 TheEnglishRoguePart2 Head, Richard, 1637?-1686? 1614 LabyrinthOfMansLife Norden, John, 1548-1625? A look at these lists confirms that our corpus contains significant examples of both the eighteenth-century novel (Richardson, Burney, Lennox) and important texts in the history of moral philosophy, for example, Adam Smith’s Theory of Moral Sentiments. Noting these landmarks, we want now to explore this overlap in vocabularies and share some preliminary thoughts about why novels share the vocabulary of moral philosophy and how those vocabularies function in each genre. The next three posts are structured as a dialogue, beginning with some remarks by Michael Witmore (a Serendip user) and Eric Alexander (Serendip’s designer). These remarks focus on how Serendip helped them to pinpoint this kinship between the two genres. In the next post, we have a “reaction” from a scholar of the Eighteenth Century Novel, Julie Park, who was recently a fellow at the Folger Shakespeare Library where Serendip was tested. Her post, entitled “Telling and Feeling, Aunts and Letters,” introduces some historical context for the development of the eighteenth century novel, moving on to show how the topic words associated with the prose fiction texts contribute to the latter’s project of rendering everyday life and moral sensibility for readers. 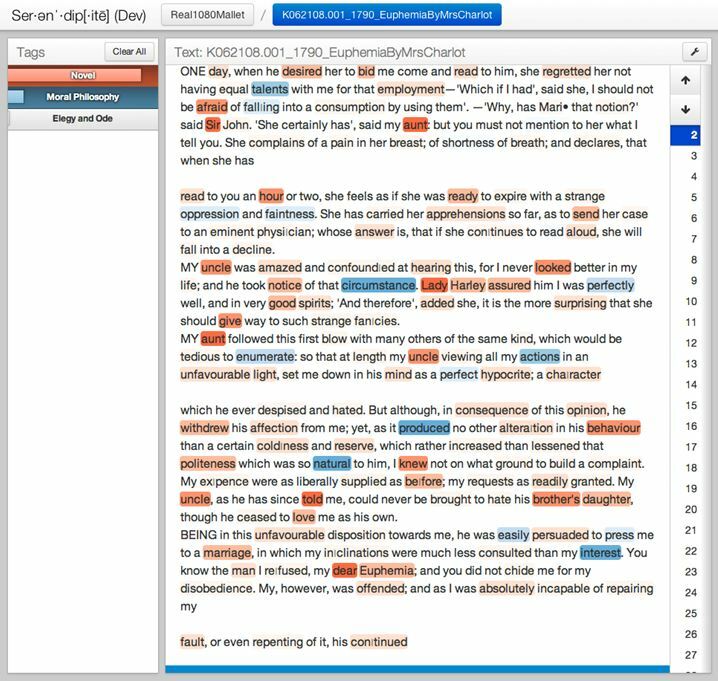 Park offers specific readings of some of the topic words that Serendip flagged as highly present of our clusters of topic words, offering the perspective of a new user/interpreter on the results produced by a software tool still in development. In a final post entitled “What Does Lennox Do with Moral Philosophy Words?” Witmore expands on Park’s analysis, offering an interpretation of the differences between the two topical fields we are associating with the novel and moral philosophy. We begin with a few words about what Serendip is and how it works. 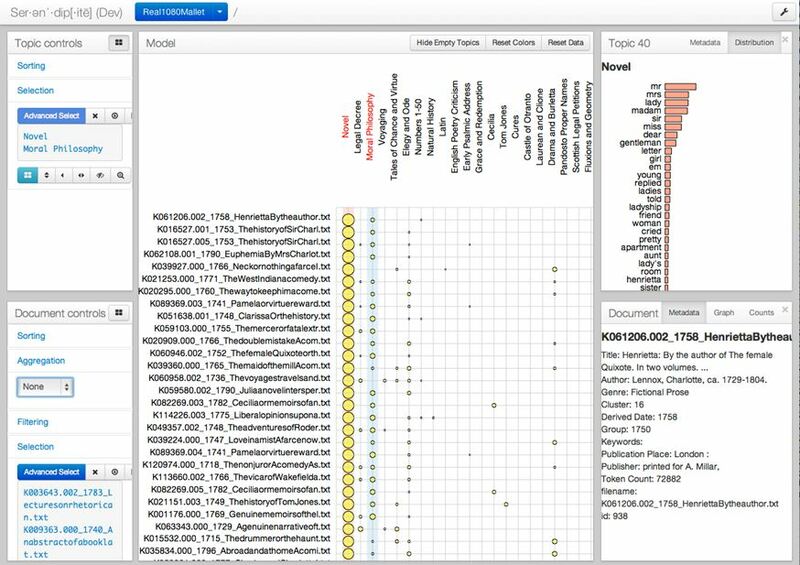 At its highest level, Serendip allows users to visualize how topics are distributed across a document set. “Topics,” in this instance, are significant collections of words (extracted by an algorithm known as Latent Dirichlet Allocation, or LDA) that tend to occur in the same documents across a corpus. Serendip displays the occurrence of these topics in a re-orderable matrix that plots documents, in the vertical axis, against topics, in the horizontal axis, indicating individual proportions with circular glyphs of varying size. Documents can be displayed individually or in aggregate groups. 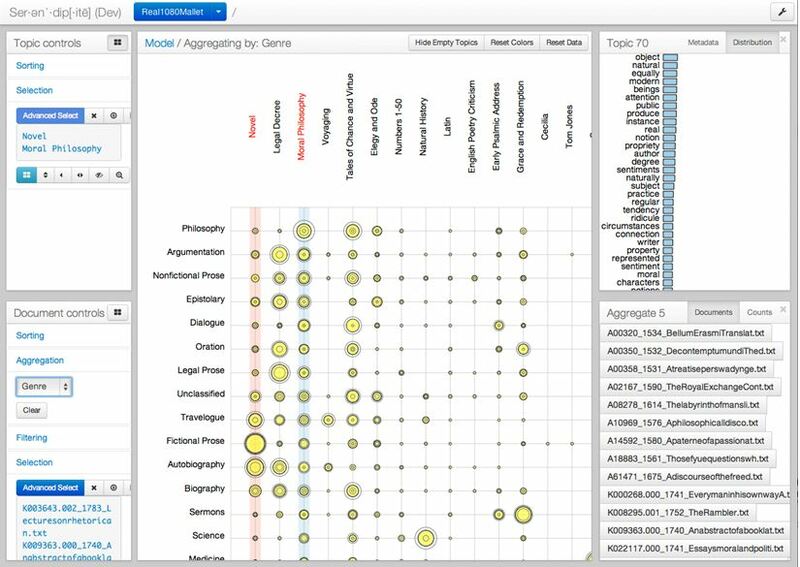 After some tuning by Alexander, who is the original designer of Serendip, a user (in this case, Witmore) takes the tool and begins to explore these topics, looking at what words they contain and what texts score highest on each topic. The power of the tool is the ability it gives its user to re-order the matrix according to individual topics, texts, or text groups. 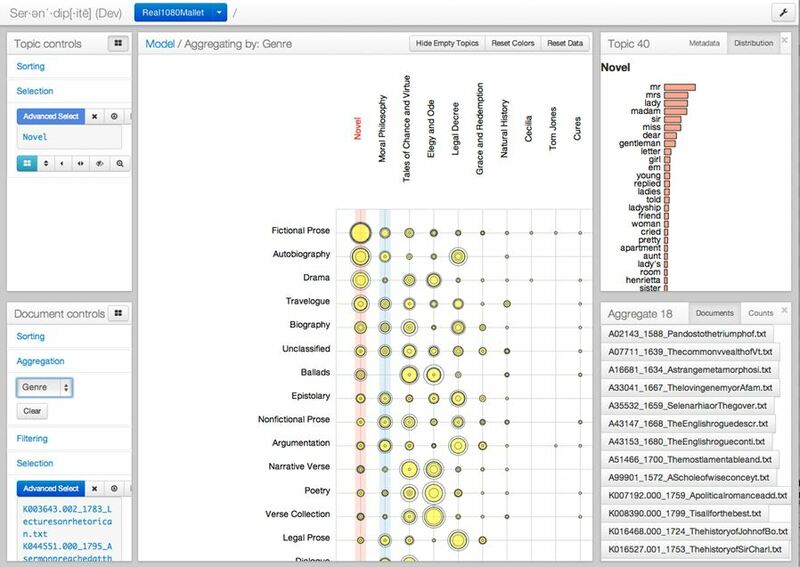 We are not going to discuss how topic modeling works in this post. (A good explanation can be found on Ted Underwood’s blog.) We do want to show something that happened when we began exploring this corpus using the topics that had been generated for us. You’ll see several screen shots below. For the time being, focus on the center pane with the yellow circles that look like planets. Across the top are the topics, which were named according to Witmore’s best guess at what they captured in texts. (Naming topics is a task that seems to have been designed for human beings: the judgments are highly contextual and built upon the study of examples.) Witmore’s topic names were based, first, on his examination of the word distribution in that topic (the window at right labeled “Novel”), but also on his knowledge of the works displayed in the lower right hand pane. 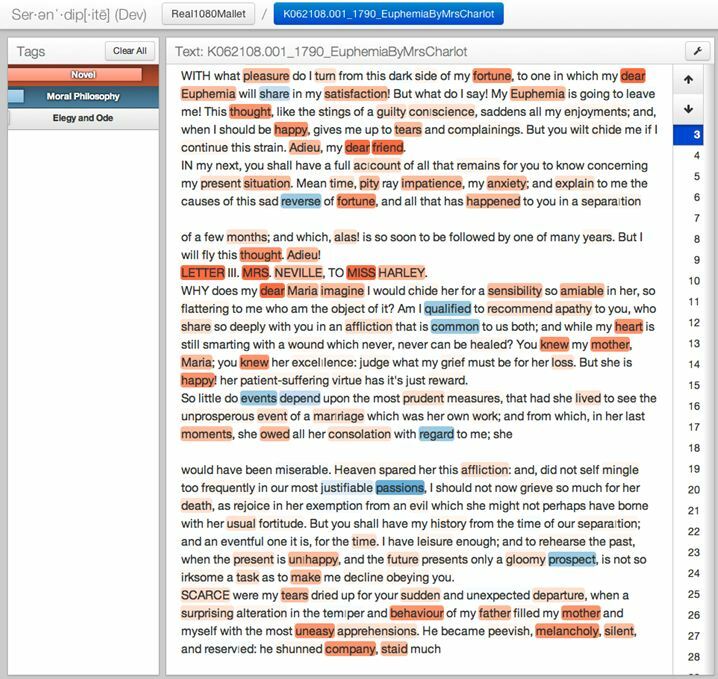 (The lower right hand pane displays individual texts within a given subgroup of texts – here the ones that our bibliographer had labeled “prose fiction”). A lot of this is subjective, which is as it should be. Neither Witmore nor Park was surprised to see that the words making up the “Novel” topic (mr, mrs, lady, madam, sir, miss, dear) occur frequently in epistolary novels, which make up a large proportion of this group. For structural reasons, the narrative voice of epistolary novels must register and mark an awareness of addressee (Mr., Sir, etc. ); letters also recount dialogue (and so, once again, use terms of address and quotational words like “cried,” “told,” “replied,”). The drama of these novels is a social one; we are not surprised to find words that tag an individual’s social standing. (Technical terms from geometry or botany are not featured high on this list, for example.) The initial finding suggested to us that we were operating in the same universe as the tool; it was doing things we understood. But you can always know what you know in new ways and you can also try to describe that knowledge in different terms. This is what we were interested in doing with the tool that Eric had built. Re-ordering was the next step in the process. An abstract of David Hume’s Treatise of Human Nature is the top scorer here, and a little further down one sees Adam Smith’s Theory of Moral Sentiments. Calling this topic “Moral Philosophy” rather than “Natural Philosophy” or “Metaphysics” was seeming like the right move. Now things become interesting. Why would prose fictional texts, largely epistolary and high scorers on the “Novel” topic, also be associated with the “Moral Philosophy” topic? What does Charlotte Lennox do that Adam Smith does as well? 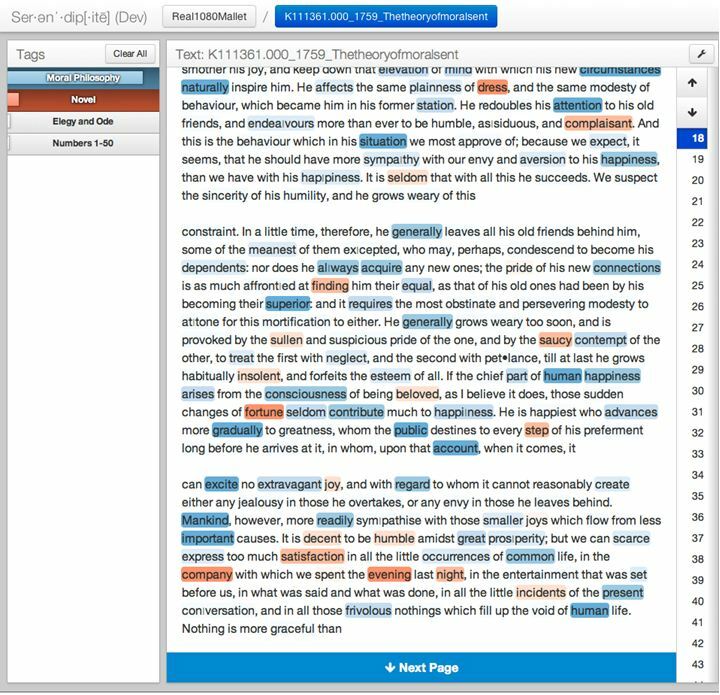 To answer this question, we needed to begin looking at the topic words in context, which we did through Serendip’s ability to drill down into the documents, allowing us to view passages. 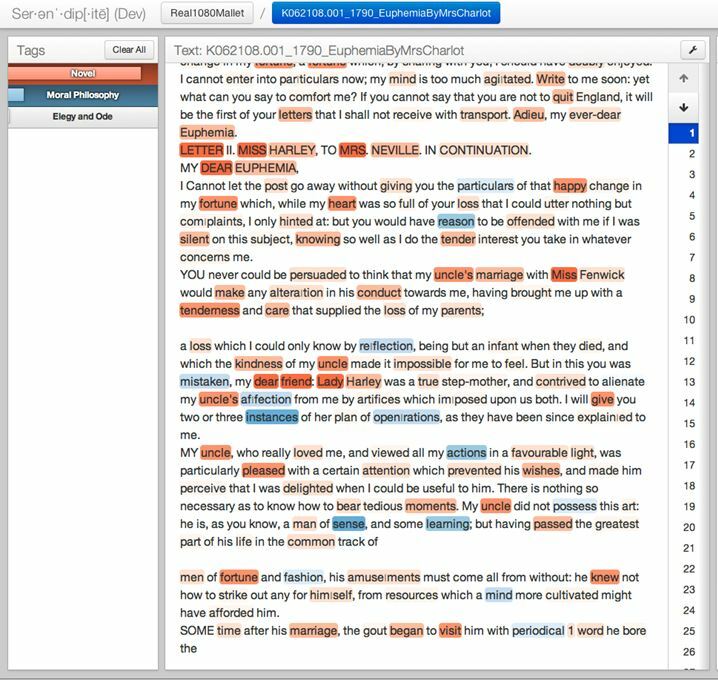 We generated several views of the texts that showed texts by Charlotte Lennox and Adam Smith with topic words highlighted in different colors (red for the novel, blue for moral philosophy). To get a sense of what the “novel” words in red are actually doing in context, we asked Julie Park to produce the reflection that follows in the next post, which begins with an analysis of novel words in Charlotte Lennox’s Euphemia. We also furnished her with several screenshots of Adam Smith’s Theory of Moral Sentiments, since this text contained a significant number of topic words that we are associating with moral philosophy. We post here a few screenshots of each work as a preface to the next installment.